The Kilby Awards Foundation is pleased to announce another Nobel Prize recipient among its Laureates, Dr. George Fitzgerald Smoot III. Dr. Smoot is an American astrophysicist and cosmologist honored in 1993 with the Kilby Award for his “extraordinary contributions to society” and particularly his discoveries in cosmic microwave background using instrumentation placed aboard NASA’s Cosmic Background Explorer (COBE) satellite. The data gathered from the COBE satellite, launched in 1989, led to significant astrophysical findings regarding the big-bang theory of the origin of the universe. Smoot was awarded the 2006 Nobel Prize in Physics with John C. Mather for "their discovery of the black body form and anisotropy of the cosmic microwave background radiation." According to the Nobel Prize committee, "the COBE-project can also be regarded as the starting point for cosmology as a precision science." In 2003 Smoot was awarded the Einstein Medal. He is currently a professor of physics at the University of California, Berkeley. Dr. Smoot has been a featured guest on the Kilby ScholarChips Video Broadcasts, which are experimental educational programs aimed at inspiring inner city and rural high school students who are sometimes not privileged to experience fine science educations or appropriate role models. In the fall of 2007, the Trustees of the Kilby Awards Foundation will “Toast” Dr. Smoot at what has become the Traditional Champaign Reception, with toasting of the Laureate and the Nobel Prize amongst a host of friends. Jack Kilby (now deceased), for whom the awards were named, received the Nobel Prize in 2000. Jury Chairman at the time of George Smoot’s selection was Johann Deisenhofer, Nobel Laureate. Richard Smalley (now deceased), Kilby Laureate who received the Nobel Prize in 1996. 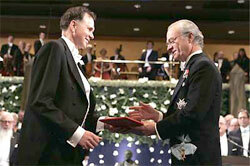 Barry Marshall, Kilby Laureate from Australia who received the Nobel Prize in 2005. Barry Marshall, the newest Nobel Laureate from the roster of past Kilby International Award recipients, will be honored in Dallas on May 31, 2006 at a Champagne Reception at the Meadows Museum. Patron Hosts who are making this event possible by their generous support include: international law firm Jones Day, Estrella Energy, David Biegler, Rolf Haberecht, Trent Miller, James Duggan, Duggan Realty Advisors, Texas Instruments, IVEC, and other Friends of the Kilby Awards, including Robert Bourdage and Bill Reeser. Special guests will include other Nobel Laureates, distinguished leaders from academia, business, medicine, and philanthropy. Dr. Marshall, a Physician and Researcher, was awarded the Nobel Prize in December 2005 for his role in the discovery of Helicobacter Pylori, a bacterium which causes ulcer like symptoms, which Marshall discovered can be eradicated with antibiotics. Marshall is a native of Australia and resides there, teaching and conducting research at the University of Western Australia in Nedlands. Dr. Marshall will Lecture at Southwestern Medical School at Grand Rounds for medical students and physicians on June 1. In the future, he is expected to be a Featured Guest in the Champions of Creativity Broadcast Program which features Kilby Laureates and is beamed to underserved students in the US, the UK, and Africa. The Trustees of the Kilby International Awards announce with deep sadness the passing on June 20, 2005 of Nobel Laureate, Jack St. Clair Kilby, the namesake of the Awards. Friends and admirers created these Awards in 1990 as a living tribute to Mr. Kilby and his seminal invention of the Chip, the monolithic integrated circuit. Kilby's invention became the essential and key component of the information society, truly revolutionizing the world. Read the full Tribute to Jack Kilby. 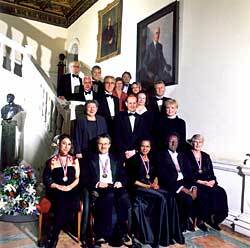 The 2003 Kilby Laureates and UK Committee, Patrons, and International Council at the Royal Society, London. Five extraordinary new Kilby Laureates were celebrated in London, England on Friday, November 7, 2003. The celebration was initated with lectures by each of the five new Kilby Laureates at the Royal Society (the world's most prestigious Academy of Science). The Awards Ceremony, Grand Dinner, and Toasting, were held at the Reform Club. Each Laureate received a Steuben crystal sculpture especially designed for the event. The keynote speaker for the Awards Ceremony was Lord Puttnam of Queensgate. Lord Puttnam is a renowned film producer who has made an extraordinary commitment to education in the UK and most recently served as the Chairman of the General Teaching Council of England, which is charged with improving and enhancing opportunities for quality education. Sir Brian Heap, Master of St. Edmund's College, Cambridge University, is Chairman of the International Jury for the Kilby Awards. Chairman of the UK Committee for the Kilby Awards in London was Jeremy Newton, CEO of NESTA, the National Endowment for Science, Technology and the Arts. Also serving on the Awards Committee are distinguished leaders from academic, corporate, education, and government circles. Guests from the United States, Africa, Scotland, Japan. On Monday, November 10 the Kilby Awards UK Committee hosted a live international video broadcast and videoconference connecting Kilby Laureates with students in an inner-city London school as well as a Kilby Laureate in Nairobi, Kenya. Partners in this endeavor included the John Kelly Techology Colleges in London and ICIPE in Nairobi. Technical support was provided by Connexus International and the World Bank. Featured Laureates included Onesmo K. Ole Moi-Yoi , current recipient, and Hans Rudolf Herren, recipient in 1994. This broadcast was the first in a series of student programs planned as a tribute to Jack Kilby throughout his 80th birthday year . Kilby is the inventor of the Chip, for whom the Founders named these Awards. The program, called the ScholarChips Broadcasts are scheduled from November 2003 though November 2004. The "Champions of Creativity," program is a unique, live videobroadcast/educational opportunity for students across the nation to experience and to interact with Kilby Laureates and members of the Kilby International Council, some of the world's most accomplished individuals and �brightest minds. Kilby Laureates are individuals who have been named Kilby Medalists for contributions to society through science, technology, innovation, invention, and education. The Kilby Awards were created in 1990 and named in honor of Jack Kilby, inventor of the monolithic integrated circuit, "the Chip." Though receiving neither early fame nor fortune, Mr. Kilby changed the world through the power of his imaginative creation of the Chip. 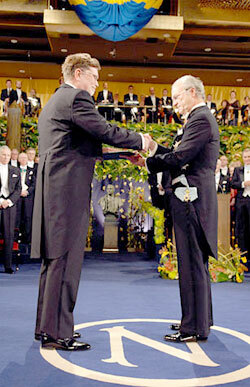 In 2000, he received the Nobel Prize. The Awards were created to celebrate these kinds of individuals throughout society and to encourage young people in pursuit of �science, technology, innovation, invention, and education. Read the full Champions of Creativity story. Read the press release for the April 2, 2003 broadcast. Read the news coverage of the October 2, 2002 broadcast. The current Kilby Laureates shown at the Awards ceremony where they received their medals. The Kilby Awards Foundation has now recognized 50 Kilby Laureates worldwide. Celebrating the achievements of these 50 Kilby Laureates inspires the young people of today, our leaders of the future. We invite you to join us as a champion of the Kilby International Awards and Educational Broadcasts. Contact us via or via telephone at (214) 768-3355. More about our current Kilby Laureates. More about our past Kilby Laureates. 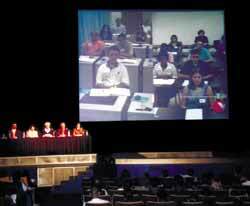 Laureates interact with inner city students from Los Angeles in the live audience, and remote student audiences connected via two-way video conference link-up. Remote audiences included rural students in Kentucky, and inner city students in Texas. This event was hosted at the historic El Capitan Theater in Hollywood, California. The Kilby Broadcast series was made possible by the support of Disney Imagineering and other generous patrons. The Kilby International Awards Foundation has created an experimental program called International Heroes for Humanity. Through the innovative use of advanced telecom and video technologies, the Kilby Laureates are shared throughout society as role models for under-served students, who are the leaders of the future. Using videoconferencing technology to reach under-served students in remote rural, inner city, and developing nations has been the first phase of the International Heroes for Humanity programs. More about the Broadcast tour. The Kilby International Awards has been named by the International Congress of Distinguished Awards (ICDA) as one of the top 116 awards in the world following their study of 26,400 recorded prizes and awards around the world. The ICDA seeks out the most distinguished and unique awards programs in the world which recognize outstanding achievement in the arts, sciences, literature, medicine, the environment, and humanitarian concerns. On December 10, 2000, Jack St. Clair Kilby was awarded the Nobel Prize in physics. Kilby was first widely recognized in 1990 when the Kilby International Awards were created and funded by an independent committee of Kilby's admirers who named the Awards in his honor as an enduring tribute to his historic accomplishments. "I'm still somewhat in a state of shock. It certainly was nothing I anticipated but I'm tremendously pleased to have it," said the Kansas-born Kilby, when first asked about being awarded the Nobel Prize. During his first summer as an employee at Texas Instruments in 1958, because Kilby had not accrued enough vacation time, he stayed back at the lab when many of his colleagues were taking their summer vacations. During this quiet time at the lab, Kilby conceived of, and constructed the first electronic circuit in which all of the components, both passive and active, were fabricated on a single piece of semiconductor substrate. This invention had enormous impact upon every area of human activity and became known as "the chip that changed the world." More on the award of the Nobel Prize to Mr. Kilby. Embracing the Spirit of Creativity for the Benefit of Humanity. To identify and celebrate extraordinary individuals who have made significant contributions to society through science, technology, innovation, invention, and education. To collaborate with organizations worldwide to fulfill the mission, by sharing these noble Kilby Laureates throughout society, both as role models for under-served students, who are the leaders of the future, and as resources to world leaders on issues that are of importance to humanity. The ScholarChips Program which evolved from the Kilby International Awards enhances the quality of leadership in the 21st Century through the creation of interactive technology-enabled programs and broadcasts which present the Kilby International Laureates as role models for under-served students in remote rural regions, inner cities, and developing countries. The Kilby International Awards were named in honor of the late Jack St. Clair Kilby, and are solely funded by the generous contributions of the founding committee, private philanthropists, corporations, and international institutions whose support is enabling the creation of innovative programs benefiting under-served students throughout the world. Mr. Kilby, inventor of the monolithic integrated circuit, the "chip that changed the world," is now joined by over fifty Kilby Laureates who symbolize the power of the individual creative mind to change the world, forever.